This week’s entry is by Master’s student Brooke Long. Brooke is conducting research on lucinid bivalves, a type of tropical clam with interesting adaptations. Chemautotrophic, sulphur-oxidizing bacteria housed in their gills allow lucinids to live in low-oxygen, sulphide-rich environments often associated with seagrass (Cervigon et al., 1993). Lucinids are the subject of a multi-year study by museum director Dr. Laurie Anderson and colleagues. Brooke describes her experiences collecting lucinid samples. The samples I spent last semester prepping were collected the previous summer by Dr. Laurie Anderson and me from Florida. Our goal was to find modern living and dead specimens of Lucinidae, a family of bivalves that possess chemosymbiotic bacteria. We spent two weeks working with Dr. Annette Engel a geomicrobiologist and aqueous geochemist at University of Tennessee-Knoxville, Dr. Barbara Campbell a molecular microbial ecologist at Clemson University, and their students searching for and collecting specimens. Field collecting in Florida makes for long days in the heat and humidity but was very rewarding. Finding locations where lucinids inhabit can be a daunting task; luckily, Dr. Anderson knew where to find Phacoides pectinatus. 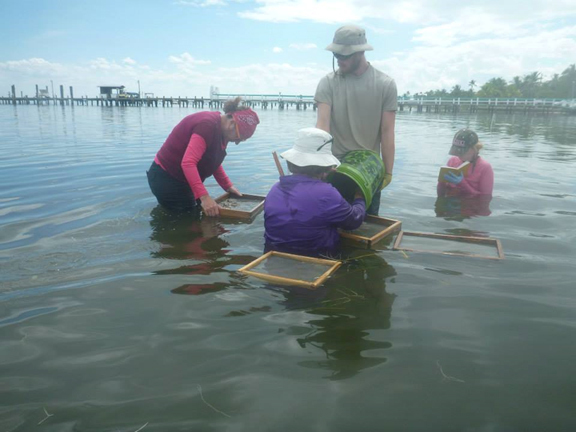 Our first week of collecting was at Wildcat Cove Preserve located along the Atlantic coast of Florida. Lucinidae inhabit the muds of mangrove forests and seagrass beds. Wildcat Cove’s banks were lined with mangroves, so we went into the two foot water adjacent to the mangroves. At our second locality, we went to the Gulf of Mexico coast and after spending two days searching the coasts of Pine Island, we found Stewartia floridana in seagrass beds. The collecting process involved plotting a ten by ten meter grid at the site and collecting data on every other square meter quadrat. We collected data on the water depth in relation to high and low tide, the surface plant coverage, noted all living and dead articulated bivalves, pore water chemistry, and collected sediment samples. A shovel was used to dig up underwater sediment from each quadrat that was sieved to find and collect paired bivalves. At the end of each day, we wrapped up the paired shells, listed what taxa of bivalves we had found, and packed them up to be shipped back to SDSM&T to be processed. By the end of our trip, we had 144 pairs of Stewartia floridana and 1,609 pairs of Phacoides pectinatus plus the other non-lucinid bivalve pairs we collected to bring back! Photo by Dr. Anderson of Dr. Engel, Dr. Campbell, and two University of Tennessee-Knoxville students digging and sifting through sediment. Here in the Paleontology Research Laboratory, I have been cleaning the lucinids, removing mud and sand found under the beak and along the hinge using a soft bristle toothbrush. The shell pairs are kept together and the outside of each numbered. The inside is left free of writing so I can use the specimens for my geometric morphometric research which involved scanning or taking images of the inside of the valve. 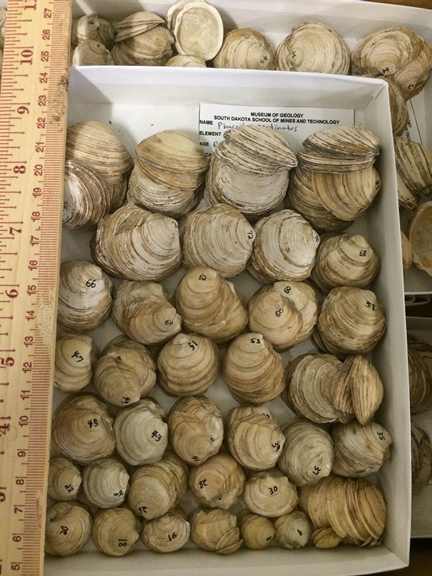 A few of the 1000+ Phacoides pectinatus specimens brought back by Brooke and Dr. Anderson. The relationship between research scientists and graduate students in just as symbiotic as that between lucinids and sulphur-philic bacteria. Students gain invaluable research experience and mentoring, transforming them into productive researchers and mentors themselves. Faculty scientists gain a young, enthusiastic workforce that not only helps us achieve our research goals, but lets us vicariously relive our early experiences learning to love research. This relationship is imperative to the advancement of science, and to the long-term stability of museums that facilitate this research. Brooke will tell us a bit more about her research in an upcoming post. Cervigon, F., Cipriani, R, Fischer, W, Garibaldi, L, Hendricks, M., Lemus, A., Marquez, R., Poutier, J., Robiana, G., Rodriquez, B. 1993. Field Guide to the Commercial Marine and Brackish-water Resources of the Northern Coast of South America. FAO Species Identification Sheets For Fishery Purposes, Food and Agriculture Organization of the United Nations.